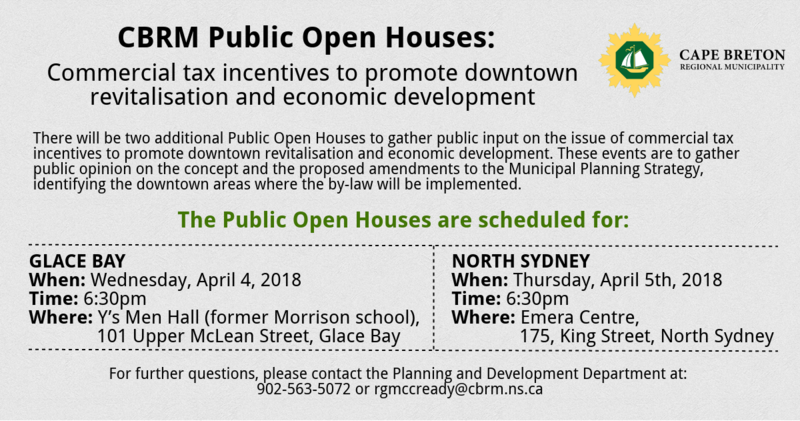 The Cape Breton Regional Municipality (CBRM) has scheduled two additional Public Open Houses to gather public input on the issue of commercial tax incentives to promote downtown revitalization and economic development. These events are to gather public opinion on the concept and the proposed amendments to the Municipal Planning Strategy, identifying the downtown areas where the by-law will be implemented. CBRM staff will be on hand to answer questions and collect feedback. There will be a brief presentation from the Planning & Development Department.